Win Cool “Monster Summer” Stuff from Comet TV and The Blood-Shed! Monster Summer, on Comet TV, started this weekend and goes all the way through Labor Day! It’s MONSTER SUMMER! The biggest, baddest and most fire-breathing summer ever! 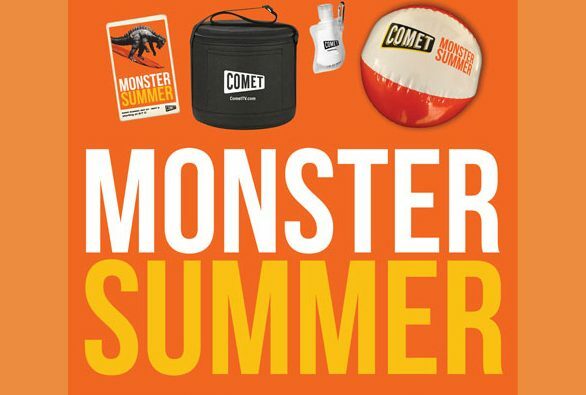 We are super excited to have a giveaway for a lucky reader to win a Comet TV Monster Summer Prize Pack of their own! Can I hear you ROAR??? Each household is only eligible to win a Monster Summer Prize Pack via blog reviews and giveaways. Only one entrant per mailing address per giveaway. If you have won the same prize on another blog, you will not be eligible to win it again. Winner is subject to eligibility verification. Contest is U.S. only. Please like The Blood-Shed on Facebook, (Click Here) like and share the post, and tell us why you love Godzilla! And of course….. please enjoy all the fun this summer on Comet TV!! Use #CometTV and #MonsterSummer to spread the word!